High in the Sibillini Mountains in the Marche Region of Italy lies the “Alto Piano”, a high plain, unique in Europe. Perfectly flat and surrounded by magnificent peaks, it is a snow bound wilderness in winter and a dry, brown, dusty one the rest of the year. Except…..for a few weeks in June when it is ablaze in an anarchistic riot of colour emanating from a profusion of lentil flowers and poppies. These are the world famous Castellucio lentils grown by farmers who live in the small village of the same name, the only reason for its habitation in an otherwise inhospitable location. The village and its plain resemble the landscape in the Bolivian Andes, true wildernesses, economically poor but rich in many other ways. It is one of my favourite places to walk, sketch, photogrpah, meditate and wonder. It has a magic of its own. 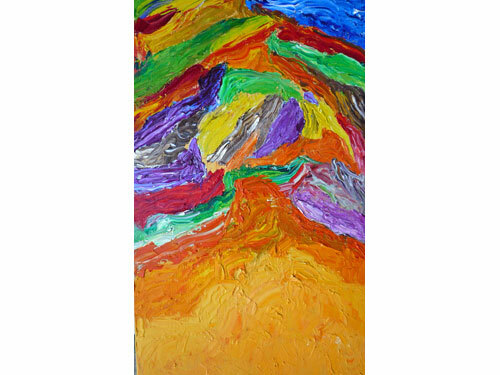 In painting it I have tried to capture its colourful essence in an abstract form, the only way in which I feel I could do it justice. Chocolate box art just wouldnt do it! 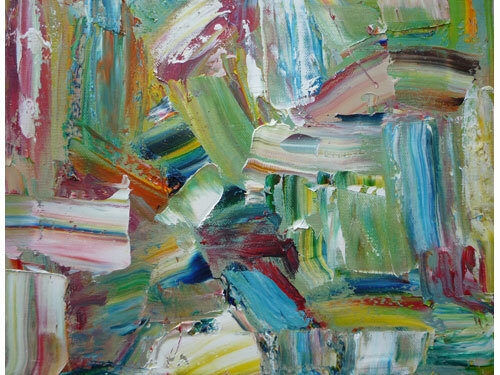 Inspirational artists include Kandinsky and Tomory Dodge, a young Californian artist who works in an anarchy of colour.